Docstoc - Free online storage and synching ~ Android Forever! With the advent of cloud computing, online storage of your documents is not only a great backup solution, but it allows you to access the latest version of your documents from any Internet connected computer. Along these lines, here's a cool offering: Docstoc. Docstoc MyDocs is the best place to keep your docs online. Quickly preview and manage any of your Docstoc documents. 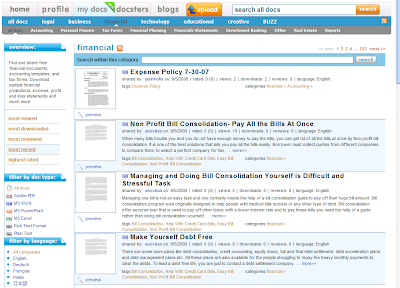 MyDocs is the best way to store both private and public documents in one central online location.